Whatever the redactions made by the AG for public disclosure, Congress should be provided with a full, un-redacted copy of the Mueller report, along with the evidence that supports it, including transcripts, documents, etc. Whatever the redactions made by the AG for public disclosure, the legal justification of every one of them must be explained. Despite his letter saying that the White House will have no opportunity for a sneak preview, Americans deserve an ironclad promise that no claim of executive privilege will be raised. No White House whitewash. According to the AG, the Special Counsel concluded that the evidence fell short of a prosecutable criminal conspiracy, which involves a high bar of proof beyond a reasonable doubt—but reached no such conclusion on the obstruction of justice issue. These facts, if corroborated by other witnesses/docs, are completely damning & overpowering in impact. If true, Cohen’s testimony reveals that the President of the United States has brazenly & repeatedly violated the law & lied to the American people. Cohen testified today that President Trump personally directed Cohen’s messaging to Congress, & his lawyers reviewed & edited Cohen’s statement—implicating Trump in a criminal conspiracy to commit perjury, making false statements, & obstruction of justice. Cohen also testified that some of those reimbursement checks were signed by Donald Trump, Jr.—implicating Don Jr. in the ongoing Southern District of New York criminal case. Cohen’s testimony is a bombshell. As set forth by him today, powerful & compelling facts implicate President Trump in serious violations of the law. According to Cohen, Donald Trump, Jr. told President Trump about the June 9th Trump Tower meeting before it happened, & Trump approved it—implicating the president in violations of federal campaign finance laws. Per today’s testimony, Roger Stone, who was coordinating w/WikiLeaks, told Trump about releasing illegally hacked emails before it happened— & before Trump made a plea for hackers to commit the crime again—implicating Trump in a conspiracy to violate Computer Fraud & Abuse Act. Full fact-finding demands McCabe be called to the Judiciary Committee in public, under oath—along with others. Explosive claims cry out for clear-eyed exposure. Stunning as McCabe’s account is, the Judiciary Committee should hear open testimony about why & when he discussed with top DOJ officials wearing a wire & invoking the 25th amendment. The American people & Congress need to hear from him directly. Uncommon, unparalleled, unprecedented. Discussion among top DOJ officials of 25th amendment is a terrifying testament to their well-founded fears about our democracy. Today I met with William Barr to ask him again to commit to release the complete Special Counsel’s report directly to Congress & the American public. He chose not to. This issue is transcendent at this point in our history. 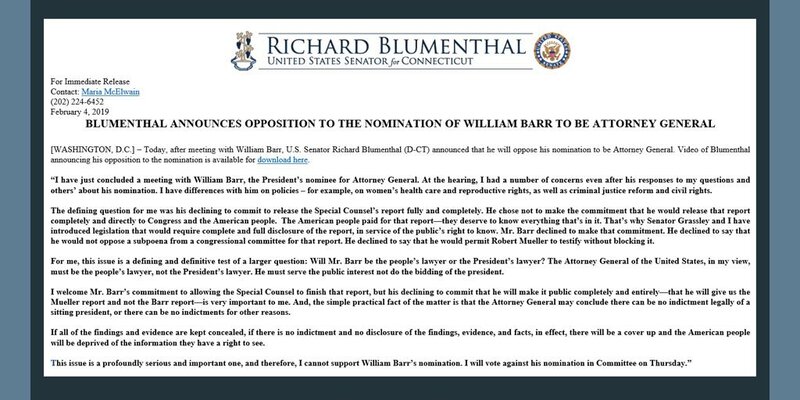 Therefore, I cannot support Barr’s nomination for AG. I disagree with William Barr on policy issues from women’s health care & reproductive rights to criminal justice reform & civil rights. And importantly: I disagree with his decision not to commit to releasing the Mueller report or comply with a subpoena to release the findings. For me, the issue of releasing the Special Counsel’s report is a defining & definitive test of a larger question: will Mr. Barr be the people’s lawyer or the President’s lawyer? The answer is unclear & that’s deeply concerning. Special Counsel Transparency Act is about a simple, bipartisan principle: the public’s right to know. 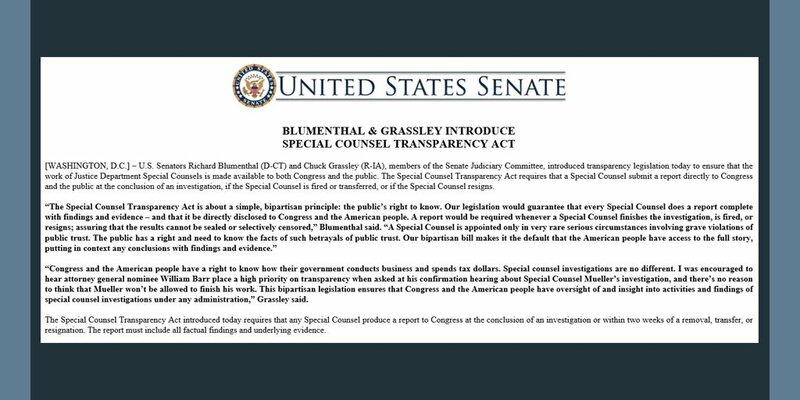 @ChuckGrassley & I are leading legislation to guarantee every Special Counsel completes a report w/findings & evidence—& directly discloses it to Congress & the American people. Transparency matters. Our bipartisan bill would require a report whenever a Special Counsel finishes an investigation, is fired, or resigns; assuring that the results cannot be sealed or selectively censored. A Special Counsel is appointed only in rare, serious circumstances involving grave violations of public trust. In those cases, the public has a right to the facts. Our bipartisan bill makes it the default that the American public have access to the full story. Sometimes the cover-up is worse than the crime: Nixon encouraged witnesses to make false statements under oath. The evidence is remarkably similar here. Even by AG nominee Barr's extremely narrow definition—it would be illegal for the president to direct a witness to lie under oath—this is obstruction of justice, plain & simple. From what we saw today, Barr has yet to quell the fear or make the proper commitment that he will not deflect & deny access to the full findings of the Mueller investigation. Mr. Barr must be fully forthcoming about his views on the Special Counsel’s investigation & any conversations with Trump or anyone else about it. He must be willing to make firm & specific commitments about protecting the Special Counsel’s investigation, ensuring DOJ’s independence from political interference, & upholding the rule of law. In an administration filled with self-enriching & self-aggrandizing grifters, Secretary Mattis stood out as a model of patriotism & public service. As a matter of national defense, but also personal integrity, he will be deeply missed across the political spectrum. In Secretary Mattis’ letter is the plea of a patriot put in an untenable position. It culminates a series of unacceptable decisions & actions by Trump alienating our allies & embracing our enemies, rejecting sound & stable advice from top military, civilian, & intel experts. Secretary Mattis’ resignation is deeply alarming—almost our worst nightmare. He leaves a chasm of leadership that could be destabilizing to national security policies & morale. This stunning @nytimes report shows that the FTC must crackdown on clear blatant violations by Facebook of the 2011 Consent Order, demanding major penalties, court orders, & other strong remedies. The snail’s pace FTC investigation of Facebook’s illegal practices is becoming a bad joke. Facebook has defiantly violated its consent order. It’s impunity should mean tough remedies. Congress must act promptly & powerfully next session with a strong privacy protection law that will protect against such intrusive, abusive misuse of consumer information. Hoping for renewed Commerce Committee hearings in early January! Facebook’s seemingly unrestrained sharing of user data is the privacy equivalent of the BP oil spill. Ongoing, uncontained, & toxic. We will be paying the price for decades. Once again, privacy is a national security issue. At a time when Putin was exploiting social media to meddle, Facebook continued to provide data access to a Russian intelligence partner. Judge Sullivan’s warning to Flynn that moving forward with sentencing today may involve jail time sends a message: trying to play games with the court or downplay serious crimes is intolerable. Fundamental to a plea agreement that results in leniency is admission of guilt & taking responsibility for your own wrongdoing. Flynn’s attempt to walk it back was met with a harsh rebuke, & rightly so. How extraordinary: the President’s former National Security Advisor stood before federal court today & admitted to a felony implicating our national security. He is cooperating w/federal prosecutors investigating the possible complicity of his old boss, the President of the U.S. Judges are never potted plants in their courtroom. They impose real scrutiny & demand real cooperation from defendants & full truth from everyone. That’s what Judge Sullivan is doing here. Trump tried to stop the Flynn investigation, discredit the prosecution & excuse criminal conduct because he fears what Flynn knows about him & others in his orbit. Extraordinary events today deepen Trump’s legal jeopardy because Flynn must tell all about what Trump did & knew concerning contacts & collusion with Russians. An exploding epidemic of nicotine addiction is enabled by federal inaction. Stop flavors, raise age limits, block slick deceptive pitches. The FDA must take aim & act. Even in President Trump’s corrupt Cabinet, Secretary Zinke stood out. He oversaw the attempted rollback of critical protections for land, water, & wildlife—including the Northeast Canyons & Seamounts—all the while, cozying up to industry lobbyists & donors. Zinke repeatedly skirted agency policy to allow family, friends, & guests, including fundraisers & former donors, to benefit from taxpayer-funded travel. In less than two years in office, Zinke has already been the subject of 15 federal investigations. At least one was referred to the Justice Department, whose investigation must be allowed to continue. Six years ago, we prayed & grieved in the wake of the senseless, horrific tragedy at Sandy Hook—& Congress turned its back. Each & every day, Congress is complicit in the deaths of 96 Americans lost to gun violence through inexcusable & unconscionable inaction. This day never gets easier—not one day, not one year, not six years later—but this year is different. America saw the strength & bravery of the Sandy Hook families & so many other courageous victims & they took their outrage to the ballot box. Predatory pricing lets drug companies rake in money at the expense of Americans’ health. The price of EpiPens shouldn’t rise by 500% over 10 years nor the cost of insulin 2x from 2012-2016. The CURE High Drug Prices Act I introduced today w/@SenKamalaHarris, @SenJeffMerkley, @amyklobuchar will give the federal gov’t power to do more than ‘name & shame’ pharmaceutical companies. HHS could turn back exploitative price increases & better fend off Big Pharma’s greed. Donald Trump’s long-time personal lawyer & fixer was just sentenced by a federal judge to 3 years in prison, including for crimes that he committed in coordination with & at the direction of the President of the United States. Cohen testified that “blind loyalty” to Trump “led me to choose darkness over light.” Powerful reminder that the President of the United States is implicated in a federal crime. This is just the beginning: Cohen’s cooperation with the Special Counsel may reveal even more. As the prosecutors said in court today, “powerful & privileged individuals cannot violate laws with impunity.” This is the bedrock of our democracy & system of law. Butina’s decision to change her plea & likely strike a deal with U.S. Attorney for D.C. is a reminder that Mueller has been delegating & decentralizing his investigation—a smart move. A number of different DOJ components now work on elements of Russia’s 2016 interference. By having other DOJ departments looking into Trump/Russia/2016, Mueller is able to 1.) take advantage of expertise in other offices 2.) ensure other legal entities, independent of the Special Counsel, will persist even if he were to be stymied, stifled, or shut down. We mustn't lose sight of the breadth of this investigation. From the NRA, adult actresses, real estate investments, illegal campaign coordination & financing... the list goes on. Such a wide scope of serious accusations indicate something in the 2016 election doesn't add up.